Key West Weddings on the Water is a private events company that offers a range of packages for weddings, rehearsal dinners, receptions and special celebrations on the beach, in a private garden or a historic property, or on a luxurious 65-foot catamaran on the ocean. Key West Weddings on the Water offers a wide range of packages for all types of weddings, which include a variety of locations from a boat to the beach and exclusive services such as catering and beverage services, floral arrangements, décor, music and entertainment, photography and videography, and more. Key West Weddings on the Water offers a range of packages and locations for spectacular weddings, including a luxurious 65-foot catamaran, a beautiful white sandy beach, a lush tropical garden, or one of the many historical sites in Key West. 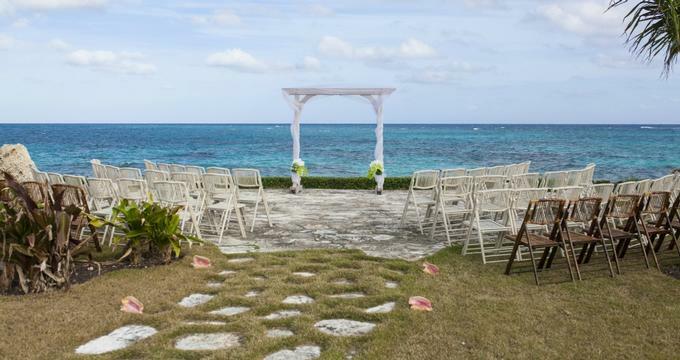 The Simple and Easy Beach Wedding Package includes a ceremony by licensed Notary at Smathers Public Beach, filing of the marriage license, a handmade bridal bouquet and a groom's pin-on boutonnière, a complimentary toast for the bride and groom, rose petals to cover the aisle for the ceremony, and an on-site ceremony wedding coordinator. The bride and groom also get two VIP Sunset Dinner Cruise Passes to enjoy. The Simple Boat Wedding Package includes a ceremony by licensed Notary at Smathers Public Beach, a handmade bridal bouquet and a groom's pin-on boutonnière, followed by a dinner and dancing reception on the 65-foot Party Cat catamaran. The catamaran features a full catering kitchen for preparing fresh cuisine for meals, and a large air-conditioned lower cabin with a state of the art sound system with a live band, live DJ, or recorded music choices, a large screen television for slideshows, and two fully stocked bars. The catamaran’s sizeable upper deck is perfect for sunset cocktails, intimate ceremonies or dancing under the stars, and the main cabin has a lighted dancefloor with a full-service bar. The Ultimate Sunset Beach Wedding includes a ceremony by licensed Notary at Smathers Public Beach, the filing of the marriage license, a handmade bridal bouquet and a groom's pin-on boutonnière, a complimentary toast for the bride and groom, rose petals to cover the aisle for the ceremony, and Tiki torches or lanterns. Also offered are aisle-runners, conch shells and starfish decorations, a bamboo canopy decorated with tulle and fresh flowers, bamboo or folding chairs, a wireless microphone, trolley/train or limousine transportation, and two VIP Sunset Dinner Cruise Passes. Key West Weddings on the Water offers a list of preferred vendors for services, which are not included in any of the packages, such as such as floral arrangements, DJ services, music and entertainment, photography and videography services, wedding cakes, officiants, and limousine, shuttle and valet services. Key West Weddings on the Water is located at 201 William Street in Key West for boat weddings and South Roosevelt Boulevard Smathers Beach for beach weddings.